The PLO Executive Committee’s Hanan Ashrawi told journalists in Ramallah today that “the last few days have been incredibly decisive for the Palestinian people”. She was speaking in a press conference called to discuss the Palestinian leadership’s 29 November move to go to the UN General Assembly to ask for a modest upgrade from observer “organization” to observer “state”. UPDATE: Amira Hass, who was one of those attending Ashrawi’s press conference, later wrote in Haaretz here, that “as the day of the vote neared, it seemed that the excitement of those behind the move was finally beginning to percolate downward. For a moment, it seemed as if the PLO had stopped thinking like a ruling organization bent on preserving the status quo and was once again thinking like a national liberation organization capable of imagining change and effecting it through the balance of international forces”. 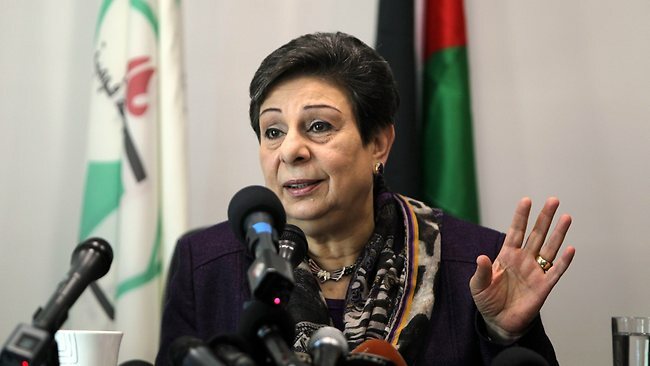 Ashrawi told journalists that “There will be a vote in the UN General Assembly at the end of the debate on Thursday on the upgrade in status of Palestine to [non-member observer] state, Ashrawi said. She added that the draft resolution for Palestine’s status upgrade to state has been tabled, it will not be amended any further, and it has some 60 co-sponsors — as well as enough support to pass in the UN GA vote tomorrow. “It is time for the Palestinians to gain their right to self-determination and independence”, Ashrawi said. “It is time the occupation is removed”. In the June 1967 war, Israeli military forces occupied the West Bank, including East Jerusalem, and Gaza. The UNGA vote is scheduled for 29 November — the date of the anniversary of the UN General Assembly’s adoption in 1947, following the Second World War, of Resolution 181, recommending a partition of Palestine, under British Mandate from the end of the First World War, into two states — on Jewish and one Arab. The State of Israel was proclaimed from Tel Aviv six months later. The Declaration of Independence of the State of Palestine was adopted by the PLO’s Palestine National Council meeting in Algiers in November 1988. Israel’s Foreign Ministry “now estimates that at least 150 UN member states will support the Palestinians” upgrade to observer state, according to a report in Haaretz, posted here. The same article reported that as the Israeli leadership realized over the last two days that its position was eroding, the decision was to “lower the profile” and make no more threats, at least for now. “Whatever we do will hurt Israel at least as much as it will hurt the Palestinians”, one Foreign Ministry official was quoted as saying. By the time the vote takes place on Thursday, it may be almost midnight in Ramallah and Jerusalem and Gaza, she noted. Though there was no announcement of either the time or the place that this will take place, reports indicate that Palestinian Authority P.A. Prime Minister Salam Fayyad will deliver a letter today signed by Palestinian leader [and President of the State of Palestine] Mahmoud Abbas to Israel’s Prime Minister Benyamin Netanyahu. On the other hand, this might not happen after all. One of the main recipients of leaked documents, Barak Ravid, has just reported on Haaretz that “Defense Minister Ehud Barak said on Tuesday morning that the meeting between between Benjamin Netanyahu and the Palestinian Prime Minister Salam Fayyad is likely to be canceled … In an interview with Army Radio, Barak said that Fayyad is not interested in meeting with Netanyahu, because of differences of opinion over the issue of Palestinian tax revenues. In addition to this, a European diplomat and two Israeli officials confirmed that Fayyad is against the passing of a missive to Netanyahu from PA President Mahmoud Abbas, which was due to take place at the meeting, and that he does want to head the Palestinian delegation meeting Netanyahu in Jerusalem. The time and place of the meeting were still unconfirmed on Tuesday morning. Chief Palestinian negotiator Saeb Erekat said on Tuesday morning that he had still not been notified by Israel of the time the meeting is due to take place. Erekat also insisted that Fayyad would be attending the meeting … If Fayyad does not attend the meeting, Saeb Erekat will head the delegation. If this is the case, it is uncertain whether Netanyahu would actually attend the meeting, or whether he would prefer Israeli negotiator Yitzhak Molcho to attend in his stead. Saeb Erekat, chief Palestinian negotiator, who is expected to attend Tuesday meeting, told the United Nations envoy to the Middle East, Robert Serry, that the meeting’s goal is merely transferring Abbas’s message and that what is important is what happens afterwards”. This situation becomes even more ridiculous. We have reported about this letter — draft versions in Arabic + English were leaked to the Israeli media — for the past two weeks. According to these leaked DRAFT versions, Abbas will say that the P.A. has lost its “raison d’etre” — a nice French term, meaning that Abbas is saying the P.A. has lost any meaning or purpose, so there is no reason for it to exist. Does anyone else remember the late Yasser Arafat saying in Geneva, when he was being pinched to say certain things in December 1988, after his proclamation of Palestinian independence in Algiers in November 1988, and he said that aspects of the PLO Charter were “caduc” [another French word, meaning something like “no longer valid”, or maybe “de facto, null and void”]. Does this not mean that Abbas is dissolving the P.A. and turning the keys over to the Israelis — unless of course they immediately recognize the State of Palestine, stop all settlement building, and agree on minor land swaps? It is not clear what the real and lasting significance of this letter will be. For one thing, it will not bind Hamas. Perhaps this is part of the Israeli interest in this “pas de deux” [a dance step, as in “it takes two to tango”]. Though Hamas might not mind too much having the P.A. declare itself “caduc“, the way this move is being choreographed will only entrench the division between the West Bank and Gaza. Al-Arabiya’s website is reporting that independent P.L.O. Executive Committee member Hanan Ashrawi [who ran in the 2006 Palestine Legislative Council elections on the same ticket as Fayyad] explained that this letter “is a last ditch effort indicating that we’re doing everything possible in order to realize a two-state solution … We hope that there’s a positive response, but we’re sending a message that, without one, we have a strategy for what follows”.